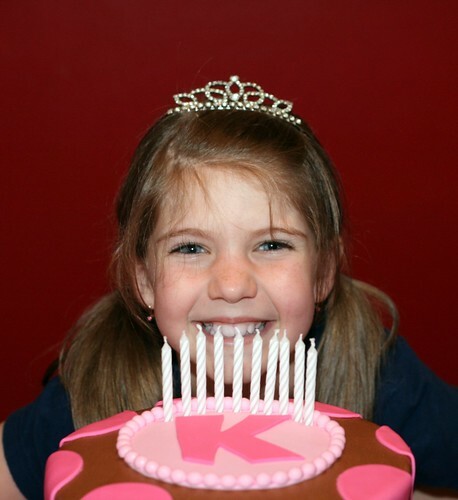 Korey turned 10 on February 17th. She wanted her party decorations to be pink and brown. 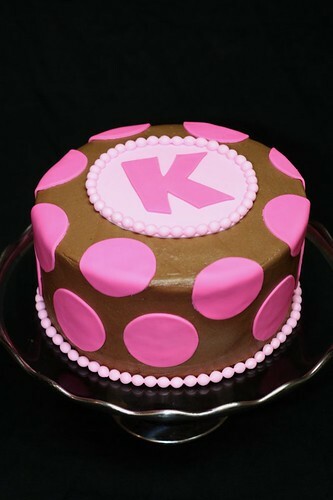 For her cake, she wanted chocolate with pink polka dots and a "K" in the middle, just like the one I put on Kasey's cake. I baked three 8" layers of Devil's Food pound cake and used Bavarian cream filling between the layers. I frosted the cake with homemade chocolate frosting then decorated it with bright pink fondant polka dots. I finished it off with light pink pearls and a circular plaque with a large, bright pink "K" in the center. Just as for Kasey's party, I displayed the cake on a glass cake pedestal rimmed in silver. It's the same one that was used for our cakes when we were kids, so it holds a special meaning to me.